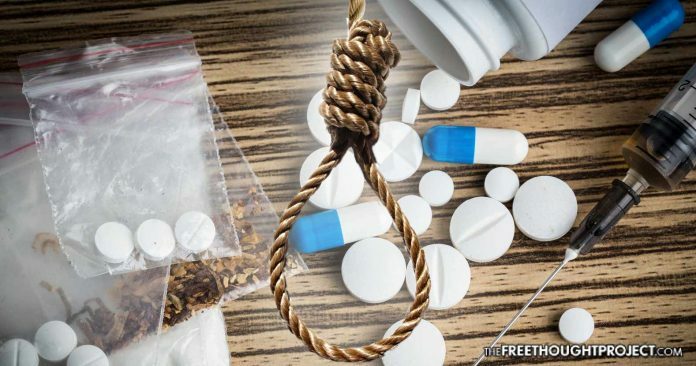 On Thursday someone with ties to the Trump administration leaked information which indicates the president plans to execute drug dealers in an attempt to curb the national overdose death crisis. But absent from the president’s yet-unannounced policy is any accountability directed toward the billion-dollar pharmaceutical pain-killer industry largely responsible for the nearly 60,000 yearly overdose deaths which have surpassed 200,000 since 1999. If it’s true the president plans to apply the death penalty for street-level heroin dealers, the same punitive measure, logically, should be applied to the pharma-cartel as well. To clarify, the Free Thought Project is not advocating for the death penalty for anyone. Government violence has not and never will be able to stop the sale and use of substances deemed illegal by the state. However, by this logic, the producers of pharmaceutical opioids are culpable under this alleged penalty. Rest assured, however, that they will undoubtedly be excluded from it due to their elite status and influence in the government. To illustrate the hypocrisy of such a move, consider the following. Below are just a few of the most notorious drug dealers who, by the president’s logic, should be included in the hit-list. First and foremost, the maker of OxyContin should be included in the list of dealers who should receive the death penalty, according to Trump. Purdue Pharma has made billions off addicting the American people to its deadly opioid. According to Trump’s plan, Purdue’s CEO, Dr. Craig Landau, and former CEO Mark Timney should be the first ones for the electric chair. By Trump’s logic, the Sackler Family should not be exempted either from lethal injection. Even though they’re not CEOs of the company, the Sackler family has been benefiting from Purdue’s profits for decades, much like a Mexican drug cartel profits from cocaine exports. Purdue is a privately held company by the Sackler family. Currently, there are at least 8 unnamed Sackler family members who are financially benefiting from the estimated 35 billion dollars OxyContin has generated while addicting and killing patients. That money, long considered “blood money” by critics, is still being used to proliferate the addiction and subsequent overdose death crisis currently ravaging the nation. The street-level heroin dealer can hardly compete with the death toll the Sackler Family and its OxyContin has amassed. Insys Pharmaceuticals, based in Arizona and maker of the deadly opiate Fentanyl and Subsys, should be next on Trump’s hit list. If Trump wants to kill drug dealers, former CEO Michael Babich and current Vice-President Alec Burlakoff should be targeted by him for the electric chair. Fentanyl, an opioid which has been proven to be as deadly as OxyContin and equally responsible for fueling the overdose death epidemic in the US was only supposed to be used in the most severe cases of pain management. But Insys was caught marketing its deadly drugs to people who simply didn’t need it, all to fatten the bottom line profits for the company. Babich has been charged and is awaiting trial on numerous corruption charges, but under the new guidelines the president supposedly will unveil on Monday, these guys need the death penalty. Trump calling for the death penalty for drug users should come as no surprise. As TFTP reported last year, Trump reportedly had a “very friendly conversation” with Philippines President Rodrigo Duterte, who has repeatedly bragged about his ongoing campaign of summarily executing people who use and sell drugs in the Philippines. Following that conversation, Trump invited Duterte to the Oval Office. Apparently, the president is now acting on the advice he received during this alleged meeting. Sadly, the president’s plan to apply the death penalty to heroin dealers further perpetuates the failed War on Drugs, and it will do nothing to stop opiate overdose deaths. However, it will likely solidify the pharmaceutical industry’s place as the number one drug dealers on the planet. Heroin addiction is usually attributed to a patient’s inability to access their prescription opiates. Few people start with heroin. Addiction to heroin grows out of a person’s desire for pain medicines and pharmaceutical drugs. If opioids weren’t marketed like candy for the millions of people who do not need them, they would likely not turn to heroin. According to the federal government’s own statistics (drugabuse.gov), 86 percent of heroin users reported their addiction first started with opioids. Any serious attempt to stop the overdose death crisis now ravaging the country must start with a scientificly proven approach — which is ending the drug war — the exact opposite of what Trump proposes.